Decked out in suits and dresses, Pitt’s LGBTQ+ alumni and current students congregated in the Gold Room of the University Club Wednesday, reminiscing about the evolution of the community and discussing plans for future growth. Pitt’s LGBTQIA+ Alumni Affinity Council hosted a reception at the University Club on National Coming Out Day. 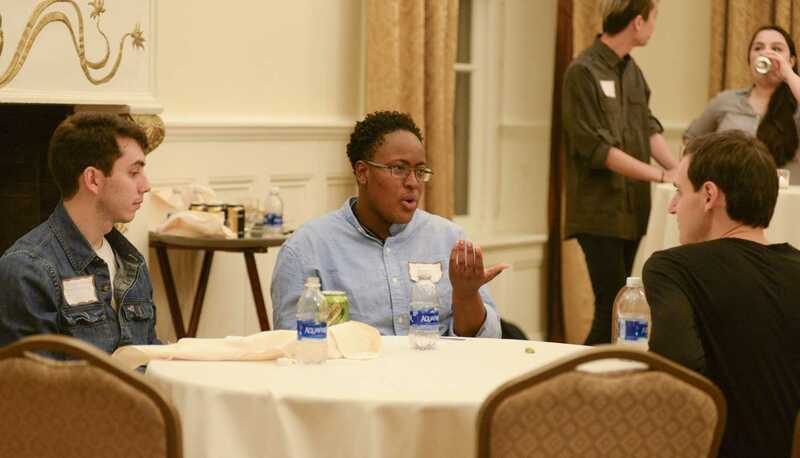 The event aimed to bridge the gap between LGBTQ+ individuals and alumni, according to Marcus Robinson, a recent graduate and organizer of the event who currently serves as a member of Pittsburgh’s LGBTQIA+ Advisory Council. Robinson, 22, explained that the goal of this networking event was to bring everyone together and create a stronger community to advocate for better events, establish scholarships and create mentoring opportunities. “The purpose of the group is to foster a better relationship for the LGBT community at Pitt, especially for alumni because a lot times there is no central office to connect us,” Robinson said. Sandra Nelson, a third year graduate student in their PhD program at Pitt, talked about the significance of this event, especially because it coincided with National Coming Out Day. Growing up in a conservative town in Arizona prevented Nelson from coming out of the closet completely in high school, Nelson said. But because Nelson’s parents are very accepting, coming out to them at the age of 19 was not a difficult experience. “But I’ve definitely taken more time to come out in an academic or professional setting,” Nelson said. Robbie Huerbin, a 2016 graduate and psychology major, had a slightly different coming out experience. Huerbin also said there was a big shift in the LGBTQ+ community from his elementary school to high school years. This event was aligned with homecoming week, which Nelson said a conflicting time for alumni in that returning home means different things and evokes different memories for everybody. Both Nelson and Sara Pecora — an alumni who graduated in 2012 — agree that coming out is becoming easier and more accepted, but it depends on the context and location of the situation. The ability to come out comfortably really depends on the tolerance of a person’s surrounding community, Pecora said. In Pecora’s case, coming out to her family was a very casual experience. Sophomore Azize Harvey — who is both the communications assistant and a board member of Rainbow Alliance — said discovering her sexual orientation is complex and ongoing. Harvey said she remembers having conversations with her family about crushes she had when she was ten years old.